The right replacement windows in your home will provide the perfect frame for a picturesque view outside. Home windows allow you to watch the kids play, take in the sunrise and sunset, or gaze at your garden from the comfort of the couch. Whether you are restoring house windows or updating them completely, Modernize is here to help you find replacement windows in Oakland, CA. We can connect you with the right company for whatever window replacement needs you may have. Get free quotes from the best window replacement contractors in Oakland, CA, ready to complete your project. As a homeowner or apartment dweller living in Oakland, California, purchasing energy efficient windows is one way to increase the resale value of your home and save money on your monthly utility expenses. In general, windows have a long life and remain resistant to weather for many years. However, with time windows will begin to break down, decreasing in energy efficiency by allowing air or moisture to enter your home. If your windows need to be replaced, there are a few decisions you must make before making a purchase. In addition to the numerous choices concerning operational style, materials used, and design, the city where you live should also influence your choice. The City of Oakland has specific permit and building requirements in place that must be followed when replacing windows. In addition to this, homeowners should consider the climate where they live and how that should influence their window purchase decisions. If you are a homeowner living in Oakland, California, continue reading to learn more about the basics of window buying, window payment options and window installation requirements in Oakland, as well as how Oakland’s climate should influence the windows you purchase. A basic understanding of the different windows available for purchase is helpful for guiding your buying decisions. There are two broad categories of windows available—new construction and replacement windows. Replacement windows are designed to fit perfectly in the space left behind by the old window. New construction windows a designed to be attached directly to the studs and frame of the home, making them most appropriate for new buildings or remodels where structural changes are being made to the surrounding wall. More specifically, windows are available with a wide variety of operational functions. For instance, one the most popular residential windows is the double-hung window. This low-maintenance window is constructed from two sashes, hung vertically. Each sash is operational, with one sliding upwards and the other downwards to open. If you a more concerned with a beautiful view and architectural interest, a bay or bow window may be the window you are looking for. These windows are constructed from multiple single panel windows that are hung in a curve, extending into the environment. Lastly, you will need to decide on the design elements of the windows you will be purchasing. Window frames are available in wood, vinyl, aluminum, or fiberglass in multiple color finishes. You can also choose from various glass grid designs and hardware finishes. Contractors hired for window replacements must have the proper licenses and insurance. The City of Oakland requires contractors making major alterations to any home in Oakland to obtain a general builder’s license from the city’s Planning and Building Office. Your contractor will need to carry workers’ compensation insurance as well. This insurance covers the cost of any medical expenses or missed work if one of the contractor’s employees is injured while working on your home. Homeowners in Oakland must ensure the contractor they have hired has obtained the proper permit for their window replacement. The City of Oakland considers windows to be a major alteration and requires a permit to be purchased from their Planning and Building Office. If you plan to install the windows yourself, you will need to obtain the permit by providing detailed information about the work you will be performing and the windows you plan to purchase. Like most of the United States, there are no tax credits or rebates available to homeowners in Oakland who have upgraded to more energy efficiency windows. However, there are more traditional methods for paying for windows including paying cash, applying for a zero interest credit card, and obtaining a home equity line of credit. Although the prices of windows vary greatly depending on materials, design, and operation, homeowners wanting to budget for new windows can expect to spend between $450 and $600 for vinyl replacement windows and between $800 and $100 for wood replacement windows. An estimated $50 to $100 should be budgeted for each window to pay for the cost of installation. The city of Oakland is located in both the north-central climate zone as appointed by ENERGY STAR®. Homes located in this zone will need to use a cooling system during the summer and a heating system during the winter. However, Oakland has a mild climate, with an average high of 72 degrees in July and and average low of 44 degrees in January. Homeowners in Oakland can use the National Fenestration Rating Council (NFRC) labels that are placed on each window to determine if the window is appropriate for the climate where they live. On this label the U-Factor, Solar Heat Gain Coefficient, Visible Transmittance, and Air Leakage are all rated. The U-Factor indicates the amount of heat that can enter or leave the home through the window. Because energy efficient windows are meant to block the home from the influence of the outdoor temperatures, it is best to purchase a window with a low U-Factor rating. In Oakland, ENERGY STAR® requires all replacement windows to have a U-Factor rating of no more than 0.30. The second number on the NFRC Label is called the Solar Heat Gain Coefficient and it is used to indicate how much solar radiation can pass through the window. Solar radiation comes in handy in the winter, providing free heat for the home but can overheat the home during the hottest summer months. 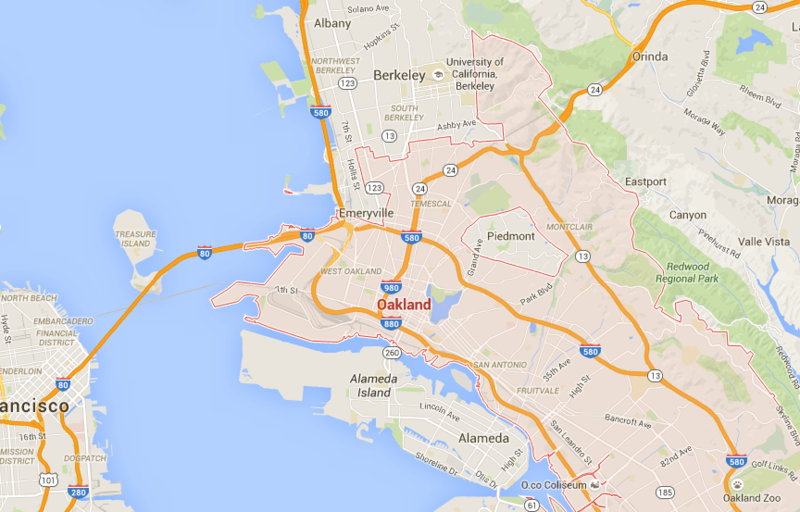 Oakland’s mild climate only requires a Solar Heat Gain Coefficient rating of 0.40 or less. The Visible Transmittance and Air Leakage ratings are the last of the numbers on the NFRC label. Visible Transmittance indicates the glass area of the window and the size of the view it provides. There are no ENERGY STAR® requirements for Visible Transmittance, but the number can be used to help you find a window that provides the view your prefer. The Air Leakage rating indicates how much air can pass through the window. ENERGY STAR® requires replacement windows in Oakland homes to have an Air Leakage rating of no more than 0.30. Oakland homeowners should keep in mind that the expense of purchasing a window with high energy efficiency is partially offset by the value the windows add to their home and the utility savings they provide. When you use ENERGY STAR® window requirements to guide your window purchases, you can expect to save an average of $126 on the cost of heating and cooling their home.